You remove the 4 Aces from the deck. 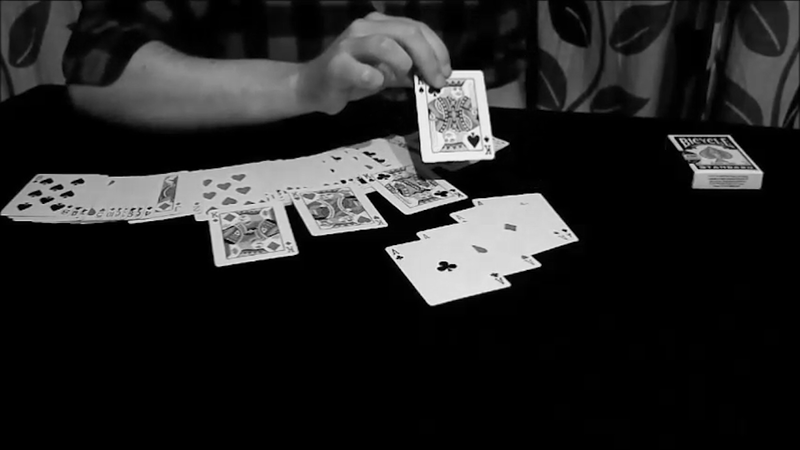 Then, with the deck face down, you start to dribble the cards, inserting the aces face up one by one at various points. You then spread the cards face up on the table where you can clearly see where the 4 Aces are (as they are the ONLY 4 face down cards). Then, with just a magical gesture, the 4 Aces appear elsewhere! Don't worry, your audience is thinking exactly the same as you are at this point -- those 4 Aces are just duplicates... Right!? The thought continues... They must be, as you can still see the 4 cards that are face down in the spread. Those 4 cards are the original Aces... Right?... WRONG! One by one, you turn them over to reveal they are no longer the Aces -- they have, in fact, been INVISIBLY SWITCHED for 4 other cards. This is the smoothest, most invisible switch possible! Download this video and learn how to perform THE INVISIBLE SWITCH!